When it comes to questions about auto start solutions in Vancouver and Victoria, Ralph’s Radio wants to ensure our clients understand and are comfortable with every aspect of the purchase. This article will serve to provide answers to the top 10 questions we get each year. 1. Will a Remote Starter Void my New Vehicle Warranty? When designed and installed properly, a remote starter will not affect your warranty. The caveat here is that we are talking about a starter system installed by a team of professionals like the technicians here at Ralph’s Radio. 2. How Much Does a Remote Starter Cost? This is a question with a nearly unlimited number of answers. It’s akin to asking what a new car costs. The answers depend on the features you choose for the system. Our team will provide a detailed quote for your vehicle based on the functionality you want. Like question 2, the answer depends on the features you choose. If it’s a basic starter with door lock control, it might take only a few hours to complete the integration process. If you want to add trunk release, power tailgate control, defroster activation or GPS locating, it will take longer. 4. What is the Warranty on the Auto Start System? Compustar remote starters have proven themselves as the most reliable on the market. The control module and our installation are backed by a lifetime warranty. Accessories like antennae and remotes have a one or three year warranty, depending on the model. 5. Can You Install a Remote Starter on a Diesel Vehicle? The starter and vehicle integration solutions we use are compatible with most vehicles on the road. Gasoline and Diesel engines, as well as hybrid vehicles, are typically no problem. Check with our team on your specific vehicle. 6. My Car has Keyless Entry, is that OK? Yes, our starters use communication modules that talk to the data network in your vehicle to start your vehicle. We have solutions for push-to-start ignition system vehicles as well. 7. Can Someone Steal My Car When it’s Remote Started? All of the vehicle security functions that came with your car or truck remain fully functional. Your doors will remain locked and you still need your factory key or remote to drive the vehicle. The remotes we offer provide 250 to an impressive 8 kilometers of range under ideal conditions. In the city, buildings and radio interference can reduce those distances. We have options for smartphone-controlled systems that use cellular communication for effectively unlimited range. 9. Do I need to Give up a Key? Very few of the systems we install require us to use one of your keys or fobs to complete the installation process. 10. 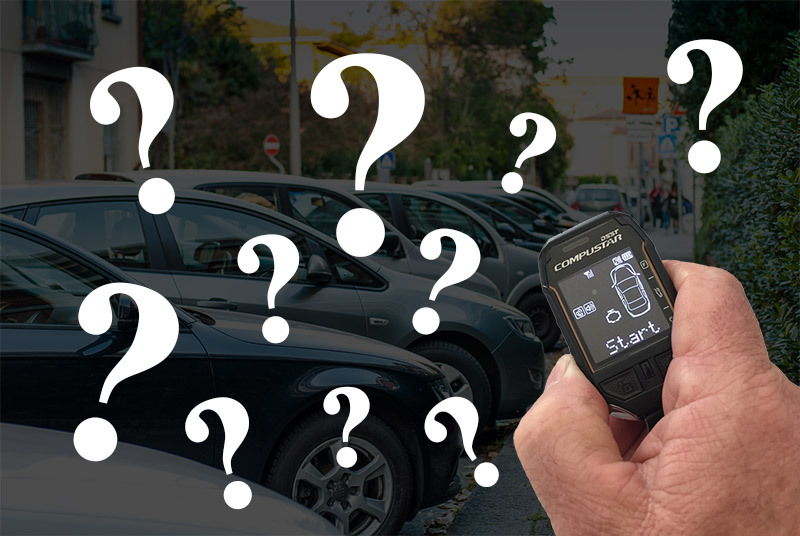 Can I use my Factory Remote to Start my Car? In many cases yes, the factory remote can be used to remote start your vehicle. The problem is that most factory fobs only work up to 50 meters away from your vehicle. You may not have enough range to start your car or truck at work or when shopping. If you have any questions about adding an auto start to your vehicle, drop by Ralph’s Radio in Vancouver or Victoria and speak with our team. You can also reach us by phone or by e-mail using our contact page.